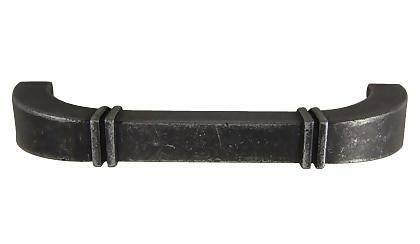 Country Style Cabinet Pull (Vibra Pewter Finish): measures 4 1/8 inches in length with a projection of 1 3/16 inches. The center to center mounting distance measures 4 inches. Comes complete with mounting hardware. Available finishes include Blond Antique, Olde Iron Rust, Weathered Nickel and Copper, Dull Satin Nickel, and Vibra Pewter (shown).